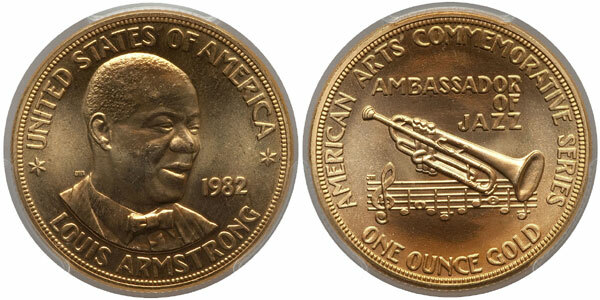 Amidst several notable design changes, the American Arts Commemorative Series entered its third year of issue with a one ounce coin honoring musician Louis Armstrong, who played the trumpet and cornet, as well as composed and sang. He is recognized as one of the most influential figures in jazz, with his influence extending into popular music later in his career. The obverse design of the medal features a right facing three-quarters portrait of the musician. He appears during his youth with a broad smile and jovial expression. The reverse features the image of a trumpet along with musical notes and the words “Ambassador of Jazz”. The inscriptions include several elements that were specifically mandated by the Treasury Department in an attempt to improve sales of the program. On the obverse are the inscriptions “United States of America”, “Louis Armstrong”, and the date “1982”. Previously the country name did not appear on the medallions. The reverse includes “American Arts Commemorative Series” and “One Ounce Gold”. The precious metal content previously did not appear on the medallions. In another change intended to make the medallions seem more like coins, denticles were added around the edge of the obverse and reverse designs. The edge of the medallion was also reeded rather than plain. The mintage for the Louis Armstrong American Arts Gold Medallion came in higher than the previous year at 420,000 with sales reaching 409,098 pieces. While it may have seemed like the changes had resulted in greater demand for the medals, the increased sales were the result of a change in the method of distribution. A contract had been awarded to J. Aron & Company to exclusively market the pieces, which was subject to minimum purchase guarantees. The firm honored their guarantees by purchasing the medals, but could only sell an estimated 15% of them. It has been rumored that the unsold medals were later melted. The low availability of the Louis Armstrong Medals on the current market seems to support the rumors.